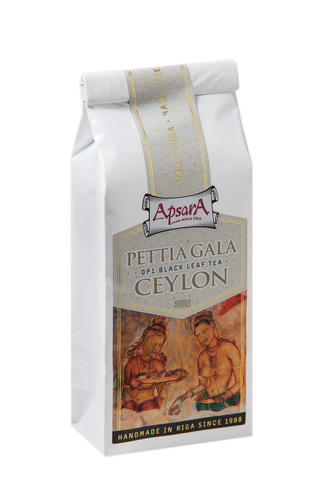 Ingredients: Ceylon high grown, black tea, Uva region. Brewing instruction : Boil fresh water. Take a 5g tea for pot 300ml and allow tea to brew 3-5min. Features&recomendation with food: This excellent tea has medium strength and characteristic honey alike flavor and aftertaste notes. Great for serving in morning, and as "5 o'clock" afternoon tea. Could be prepared along with “English style” breakfast, or with snacks at the afternoon. Product highligths: Sri Lanka or Ceylon can be truly proud of it’s high class black teas, which are maybe best among others. Like elsewhere in the world, the geographical location and climate strongly influence final taste and flavor of processed tea. Sri Lankan island has a number of different tea growing regions. Tea garden "Pettiagala" is located in the so-called "eastern" or Uva region. The abbreviation OP broadly known as Orange Pekoe, indicate that tea consists only first and second tea leaves.